The tribal chief asks who will challenge his claim on her, expecting her for himself, but Uthu raises his hand. The chief says that Uthu has to pass his test of manhood first, and hands him a spear. 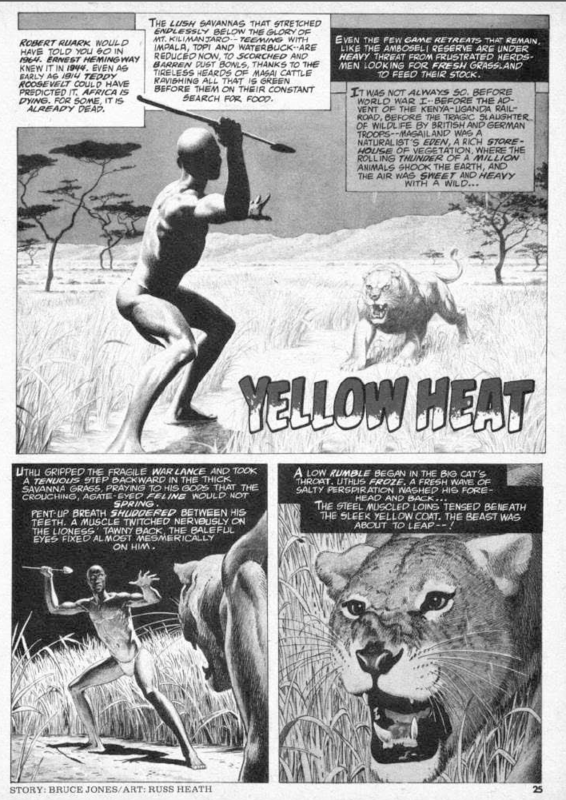 The task is to kill an adult lion by himself with just a spear within three days. As a child, Uthu saw another villager carried off by such a beast. He attempts to lure the lion by setting a trap. Uthu waits for the lion to catch him only to see it struggling with a giant snake; the snake ends up crushing the lion. Uthu kills the snake and brings the dead lion to the village. That is a disappointingly gratuitous ending. I understand why it's so notorious however, that was a pretty good twist. Ah, thanks. I needed my dose of racism for the day. 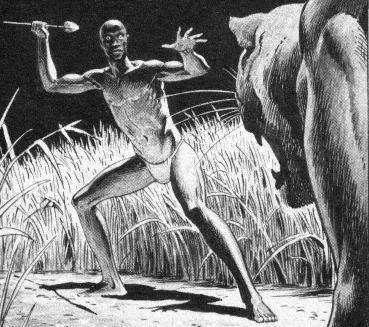 A story circulating primarily in white America, depicting African people as, at their heart, cannibals? Yes, I think that could be seen as racist. To be honest I'm surprised anyone sees it as non-racist. "Eater of human flesh" puts all other negative stereotypes to shame. I'm not sure I'd go that far- cannibalism has been (and may still be to some degree, although it can be hard to seperate actual practices from what's just hype for the tourism industry) practiced with respect and reverence for the dead in various cultures at various times. (It's not particularly healthy, for a number of reasons, but that's another issue entirely). That's not what's happening here, mind you, and yes, I would agree with the statement "...I'm surprised anyone sees it as non-racist." The only defense I can mount is that the opening narration suggests it's at least partially the White Man's fault that they're acting like this. Western Imperialists have #*$&'ed up Africa's ecosystem so badly that there's virtually no game left for the natives to hunt. I wonder why the text keeps emphasising "native girl" rather than just "girl". Is it to make absolutely clear that she's black? That is an interesting point, especially as Uthu and his tribe *aren't* referred to as native. Maybe they're not from around those parts. Yea - that really grated me too. I guess they really wanted to sell the "exotic" quality or something. Well yeah, you wouldn't want your audience getting confused and thinking it might be a white girl who was being killed and eaten.